A magnificent maiden ton to Junior Gallichan was the highlight of the week as the first grade juggernaut continued on to record their second consecutive win over South Sydney. Farmer almost bowled 2’s to an unlikely victory with another 6-fa, some solid individual performances weren’t enough to get 3’s home, 4’s came out with aggression to ensure there was no collapse in their chase of outright points and 5’s can into a team that was more than a match for the secretary’s slow straight ones and his doinking to cow corner, as they lost a heartbreaker despite a solid 65* from Papa. With 1’s and 4’s guaranteed of finals cricket, 2’s needing a few more points, and 5’s needing some good performances and a bit of luck, it is very important to get to training to ensure we finish as high as possible now that the rainy season is starting, and it’s an opportunity to push to cement or challenge for a spot in a finals side. Given all the possibilities with player availabilities, if you are unavailable for any day of cricket between now and Christmas 2017, please let the club’s brains trust (pictured below) know on the 24 hours selection hotline. Play resumed on Day 2 with Souths at 5 for 128. We didn’t get the early wickets we were looking for and the pitch proved to be very flat and excellent to bat on. The Souths tail wagged well and they declared their innings at 9 for 251 from 80 overs. The Skip picked up 6 wickets, Hotly 2 and an ‘amazing’ run out to Byrny. That left us with 52 overs to score the runs. Mantarro making his first grade debut was looking confident until he spooned one to mid-off. Fish then went the same way for a well made 30 before Richie decided to make sure their mid-off really could catch to be out for 31 with the score at 3 for 107. Jacko and Maxy then came and went without really troubling the scorers which brought the supercoach to join Gall jnr at the crease. After surviving an early scare Peter played a marvellous intentful knock … really full of intent. Together with Supercoach they put on a quick-fire 80 run partnership until Tommy held out for 43. Holty then came in and batted very well for 21 not out but the day belonged to Pete who brought up his maiden century for the club with his 13th boundary which also sealed the win with 3 balls in the day to spare – great knock mate! A vital 6 points for first grade which keep us on top of the ladder which is becoming very congested. 2’s turned up to Alan Davidson with a massive task confronting them to get the points and stay in touch with the top (link to Sydney Roosters deleted) teams. A pretty flat surface was presented, and we would have to bowl pretty well to restrict the bunnies and stave of possible outright defeat. Skipper bez opened up with his good self as well as inform money man farmer operating into a breeze conducive for spin and drift. Bez applied some good early pressure in the form of consecutive maidens while the bunnies top order took some delight in skipping down the track to farmer and trying to whack the ball over duck man’s head at midwicket, missing them and being stumped twice by wes. Furthermore, when an edge to Neddy was taken and a plum LBW all courtesy of farmer we were right back in the guts of the contest at 5/41. A short partnership followed… but after one of their bats pumped a BFBR half volley to painter at mid off and farmer got another LBW the bunnies were in some strife and the coves looking for the killer blow. A fabulous direct hit run out from a waddling duck man made the contest even more interesting, with duck man shuffling his ned to the left, the ball bouncing off his blurt into his mits, then roasting a throw which chargrilled middle stump. But it was not to be… Skipper Bez, Dodds, BFBR all agonized over a third slip… opted for a short cover, and then saw the ball float through there at a nice catchable height… insert appropriate expletive here. Skipper May and a very gutsy young bunny (had worn one at training during the week) saw the bunnies home safely and all out for around 90 with a lead. With the 6 points gone we fluttered around in the second inning batting out most of the day, not finishing til 6.45 as the bunnies chased 111 of 11 overs without ever really being a chance of getting the 10 but ensuring a more sober afternoon than anticipated for both parties. Need to get act together before NWS and make sure of finals position as we are giving 7th & 8th every chance to somersault into 6th. Well done to 1’s and 4’s. Demps declared overnight with a lead of 80 to give the Coves a full day to bowl at the Bunnies and chase outright points. Cox and Molloy again opened up but found the going a little harder this time around. Molloy grabbed number one with a drive popped up to mid off before snaring two with his stock pegs delivery. Scotty came on and picked up one almost straight away, but The Bunnies were certainly fighting a lot harder this time around and the two batsmen in managed to play a few gutsy shots inbetween a few lucky breaks to put a few runs on. Marty Tzikas came into the attack and was immediately successful - removing the doinksman with a short ball in his first over. Marty took wickets fairly regularly and ended up with the neat figures of 5/16 off 6 overs, with Coxy coming back on to pick up another pegulation of his own. Souths managed 81 in 34 overs, just enough to make us bat again. Chasing 2, the boys made hard work of it. Dash did not attempt to hit any of the four balls he faced out of the park, while Rixon likewise disappointed by only trying to hit the last ball of the innings for four. 0/2 off 0.5 overs... boring. Big game this week against form team NW Sydney. We'll need to be on top of our game in this one. Spots at the top of the tree are up for grabs. Nothing but the best for Lance Cove’s finest as the Sky Muppets tilt at finals glory was moved to Manly Oval against Warringah’s Men in Green. That’s riyyyeetttt trendsetters, Manly’s first grade oval. Hmmmm…..Delightful. Great facilities at Manly Oval. Even better scenery too with many a passer-by having Lance getting rather hot and bothered. Not sure if it was the Eff-Me pants or not but it certainly was entertaining. So – another scorching belter of day had Lance’s men praying for the Fat Schnitzenegger to win the toss and have a bat. No one felt like bowling in 40 degrees. However, the cagey Schkip felt we had a better chance with our strong bowling attack to hopefully skittle the Green Men early doors and chase down the total using the fast outfield. Well, that didn’t damn well work did it. Lance’s finest could only manage 4 wickets as the Men in Green absolutely PILED on the runs in what was the highest total against the Sky Muppets in a long time. To be fair, they batted really well and have quite a few talented kids in what is their development side. Well batted lads. However, it must be said that at times we bowled and fielded like absolute cane toads. Utterly disappointing. I’ll stop there……. So – the Green Men amassed 229 from their 45 overs and the Sky Muppets were faily well knackered after that experience in the heat. Awesome tea provided by Warringah (thanks folks – muchly appreciated) at the change of innings allowed the Coves to regroup and tackle the task at hand – if we wanted to play in the finals we needed to chase down 230 for victory. Wowee. Cracking start for the Men in Green early doors with Lance Cove losing his 2 openers. Fat Secretary (who burgled just the 1 pole Dodds) didn’t notice the deck was a road and drilled one to mid-on whilst Spruce Willis was still in love with everyone from his 11pm-6am Techno Dance-athon Disco Biscuit thingy and missed a slow straight one. Slow straight ones do a job Phil….. This had the Guvnor and Papa get going until Matty Donegan, in a display of absolute sportsmanship, walked when he edged one down leg side to the keeper. Well played Matty. Some will argue to never walk, however it's the way Lance likes to play his cricket and its why Lane Cove is continually acknowledged in the Spirt of Cricket. So Papa was holding it together as Sharples, Fat Schnitzenegger and Push-a-car fell around him. He then had to retire at 60 as per the rules. Thinks looking good for the Green Men with Lance at 6-100 odd chasing 230. Then some Coves really hunkered down. Benny Broyd (39), Clarkey (31) and Trums (34) got us to the last over need a run a ball. With the field spread and Papa back in we were looking a genuine chance in an absolute nail biter. What ever was going to unfold in those 6 balls had already seen 2 great sides put on over 450 runs in the day in great spirit and tenacity. If we get these 6 runs the Sky Muppets move into 4th and are a red hot chance to make the finals for the 2nd year in succession. Sadly Muppet Lurvers, the fairy tale was not to be and we fell agonisingly short. The frustrating thing is that at times we showed an immense amount of ticker with the bat (Papa, Clarkey, Trums and Broydy in particular) – however at other times we let ourselves down with either bat or ball. Any McHoo, heads up lads. All is not lost – we’ll just need to win the last 3 games and hope the results go our way. Role on the Bunny Boilers this Sunday @ Tantallon and get down there and ride your favourite Muppet. 3 – Papa. Really, really well batted lad. 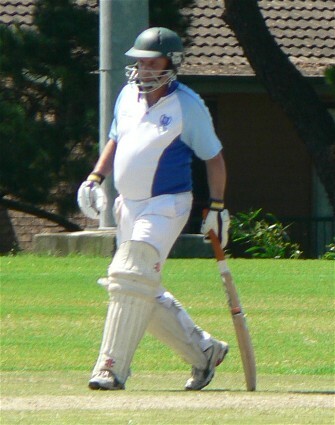 2 – Trums – batted himself back into form and took 2 poles. Solid. 1 – Clarkey – showed a lot of ticker as usual. Batted and bowled well. A former South African first class player. Represented Easterns Cricket at U15, U19, U23 level, before making his first class debut in 2003 against Titans. A surprise call up to first class cricket was embraced by Barresi as he went on to score a superb 57 on debut against one of the toughest teams in the franchise. Also featured in an elite Academy squad that was brought together by the Titans in 2002/2003. Now represents The Netherlands at international level making his ODI debut in 2010 against Scotland in the World Cricket League. A top order batsman with a wide array of strokes.